Food is not just sustenance. It is memories, a lobster roll on the beach in Maine; heritage, hot pastrami club with a half-sour pickle; guilty pleasures, a chocolate rum-soaked Bundt cake; identity, vegetarian or carnivore. Food is the sensuality of a ripe strawberry or a pork chop sizzling on the grill. But what if the very thing that keeps you alive, that bonds us together and marks occasions in our lives, became a toxic substance, an inflammatory invader? In this beautifully written memoir, both gut-wrenching and inspiring, award-winning writer Jon Reiner explores our complex and often contradictory relationship with food as he tells the story of his agonizing battle with Crohn’s disease—and the extraordinary places his hunger and obsession with food took him. I have not personally read this book yet & I am not sure that I will in the immediate future due to the bad memories I have from my stint of serious Gastroparesis back in 2006. From the description, reviews & the first few pages I’ve read it sounds as though his experience was somewhat similar to mine. The concept of food being poisonous or causing harm is such an alien concept to most. Our society literally runs on food. You really do not notice how many food commercials there are or how there are one or more restaurants or food stores practically every block, until you’ve been robbed of the ability to eat. When eating makes you ill, it turns your life into a paradox, you must eat to live but eating almost seems to be killing you. It doesn’t just take a toll on you but on those around you who are unable to change your predicament. I am not sure I’d recommend the book to those currently suffering through a bad digestive illness, although it might provide an avenue of sympathy, someone who has been there, who understands. To those who are in the good graces of the digestive gods it might do them good to read the book & count their digestive blessings even if the subject matter causes some indigestion. You can pick the book up at your local bookstore or on Amazon. You can also read the first couple of pages on Amazon.com as well. Well, this is one of the more curious reviews my memoir, THE MAN WHO COULDN’T EAT, has received. Like any author, I welcome the exposure, but this is the fist time I’ve had a reviewer volunteer that he’s not read the book, but still weigh in with an opinion. What a strange business we’re in. I actually did not mean for this to be a review, but more of a news article alerting people to your book. It looks like it got auto-tagged as a “review”, which it is indeed not. The opinion I left was more based off my own experience dealing with Gastroparesis & how it sounded like it might parallel your experience somewhat. The memories of this time are not fond memories. 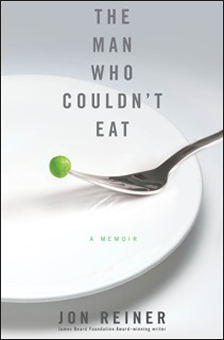 If someone had handed me a book called “The Man Who Could Not Eat” while I was dealing with exactly that problem, I am not sure I would have cracked the book open because I did not want to “live through” another person’s illness at the same time as my own. Not everyone is the same & not everyone would have that reaction, but I’d imagine that would have been mine. This isn’t a failing of your book & my suggestion that people who are ill might not want to read it was not meant to be negative, but more a precaution to someone going “Oh so & so is having that problem, they should read this…”. This book — which I could not put down — is a beautifully narrated tale of what it’s like to live with chronic illness. Jon’s descriptive abilities are quite marvelous.